immigrants currently living in the U.S. should be allowed to stay in the country legally, if certain requirements are met. These views have fluctuated only modestly over the past two years. As in prior surveys, a majority of those who favor granting legal status for people in the U.S. illegally – 42% of the public overall – say they should be able to apply for U.S. citizenship. About a quarter of the public (26%) say they should only be able to apply for permanent residency. The survey by the Pew Research Center, conducted May 12-18 among 2,002 adults, finds less agreement when it comes to other opinions about immigrants and immigration. About half (51%) say immigrants today strengthen the country because of their hard work and talents, while 41% say immigrants are a burden because they take jobs, housing and health care. The share saying that immigrants strengthen the country has declined six percentage points since last year. A majority of Republicans (56%) support a path to legal status for undocumented immigrants in the U.S. At the same time, far more Republicans say immigrants are a burden on the country (63%) than say they strengthen the country (27%). Among Democrats and independents – majorities of whom also support a path to legal status for people in the U.S. illegally – most say immigrants strengthen the country (62% of Democrats, 57% of independents). However, while most Republicans support allowing undocumented immigrants to stay in the U.S. legally if they meet certain requirements, a majority (58%) views a path to legal status as a reward for doing something wrong. 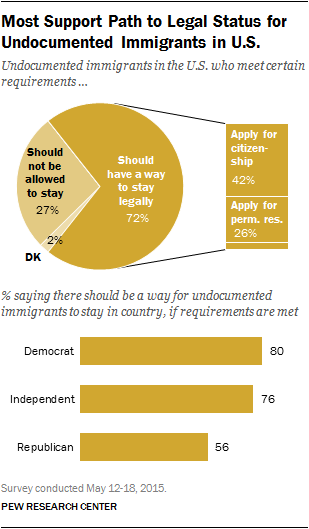 By contrast, just 23% of Democrats and 33% of independents say that giving undocumented immigrants a way to remain in the U.S. legally is akin to rewarding them for doing something wrong. The survey finds that as debate over legal immigration also heats up, the public is split on the best approach for the country. Slightly more say legal immigration into the United States should be decreased (31%) than increased (24%), while a 39% plurality says legal immigration should be kept at its present level. Among Republicans, 42% think legal immigration into the U.S. should be decreased, compared with 34% who think it should be kept at its present level and just 21% say it should be increased. Fewer Democrats (27%) and independents (28%) think legal immigration should be decreased, with pluralities of both groups saying it should be kept at present levels. There also are socioeconomic differences in attitudes toward legal immigration: 35% of those who have not completed college favor cutting levels of legal immigration, compared with 25% of college graduates and 18% of those with post-graduate degrees. And across income levels, those with lower household incomes are more likely than those earning more to say legal immigration should be decreased. Most Think Border Security Can Be Improved. About half (51%) say “a lot” can be done to reduce illegal immigration at U.S. borders, while another 29% say somewhat more can be done. Relatively few (17%) say not much or nothing can be done to improve border security. These attitudes are little changed from 2013. Republicans Critical of Party on Illegal Immigration. Just 34% of Republicans and Republican-leaning independents say the GOP is doing a good job in representing their views on illegal immigration, while 59% say it is not doing a good job. Democrats give their party more positive evaluations in dealing with this issue. About half (51%) of Democrats and Democratic leaners say the party is doing a good job in representing their views on illegal immigration, while 43% disagree. Democrats who support a path to legal status are more likely than those who oppose it to say their party does a good job of representing their views on illegal immigration. Among Republicans, both supporters and opponents of legal status for immigrants here illegally think the GOP is not doing a good job representing their views. 37% Approve of Obama’s Handling of Immigration. The May survey finds that Obama gets some of his lowest issue approval ratings for his handling of the nation’s immigration policy. About four-in-ten (37%) approve of the way he is handling this policy, while 56% disapprove. Whites disapprove of Obama’s performance on this issue by more than two-to-one (65% to 29%). Hispanics are divided (48% disapprove, 44% approve), while 66% of blacks of approve of Obama’s handling of immigration policy. Hispanics, younger Americans and Democrats are among the most supportive of both allowing undocumented immigrants to remain in the U.S., and having the opportunity to apply for U.S. citizenship. Fully 86% of Hispanics say there should be a way for undocumented immigrants who are living in the U.S. to remain legally, if certain requirements are met: 54% say they should be able to apply for citizenship while 30% say they should be able to apply only for permanent residency. Smaller majorities of blacks (72%) and whites (69%) favor allowing undocumented immigrants to stay in the U.S., and about four-in-ten in each group (38% of blacks and 41% of whites) say they should be able to apply for citizenship. About eight-in-ten (81%) of those younger than 30 say undocumented immigrants should be allowed to stay legally, and a majority (53%) say that they should be allowed to apply for citizenship. Among Americans over 50, a smaller majority (64%) supports a path to legal status, while about a third (34%) say undocumented immigrants should not be allowed to stay. There is a similar pattern in attitudes about whether providing legal status for those in the U.S. illegally amounts to a “reward” for wrongful actions. Republicans (58%) are far more likely than Democrats (23%) or independents (33%) to say that allowing undocumented immigrants to remain in the U.S. is a reward for wrongdoing. Notably, the share of Republicans who think of a path to legal status as a reward for doing something wrong has increased nine points (from 49%) since May 2013. Over the same period, the percentage of Democrats who express this view has declined six points (from 29% to 23%). Independents’ views are largely unchanged. Roughly four-in-ten (43%) adults 50 and older think allowing undocumented immigrants to gain legal status is a reward for wrongdoing, compared with 27% of those under 30. And Hispanics (19%) are less likely than whites (41%) to view granting legal status as a reward for doing something wrong. Views on Legal Immigration to the U.S. When it comes to legal immigration, a 39% plurality supports keeping levels as they are currently. Of those who think levels of legal immigration into the U.S. should change, a somewhat greater share says legal immigration should be decreased (31%) than increased (24%). The share of Americans who favor less legal immigration has not changed much since 2013 (36%), but it has declined over the longer-term. A decade ago, 51% said legal immigration should decrease, and in 2010, 41% expressed this view, according to CBS News/New York Times surveys. Twice as many Republicans think legal immigration should be decreased as increased (42% vs. 21%) while about one-third (34%) want to keep it about the same. Among Democrats, a similar share wants a decrease in legal immigration (27%) as an increase (24%), while a 43% plurality says it should stay the same. Independents’ views are similar to those of Democrats. There is a correlation between opinions about path to legal status for people in the U.S. illegally and views of legal immigration to the United States. Among the minority that opposes a path to legal status (27%), 49% favor decreasing legal immigration into the U.S. Among the much larger share that favors allowing undocumented immigrants to stay in the U.S. legally (72% of the public), only about half as many (25%) support a reduction in legal immigration into the U.S.
Views of Immigrants’ Impact on the U.S.
By a 51%-41% margin, more say that immigrants today strengthen the country through their hard work and talents than say they are a burden because they take jobs, housing and health care. The share saying immigrants strengthen the country has edged down from a high of 57% reached last year. Over the longer term, the balance of opinion on this question has grown more positive. In Pew Research Center surveys conducted since 2012, somewhat more have said that immigrants strengthen the country than burden it. Throughout the prior decade, opinion was typically more divided, and in 2010, more viewed immigrants as a burden (50%) than a strength (39%). Majorities of younger adults take a positive view of immigrants’ impact on the country: 64% of those 18-29 and 60% of those 30-49 say that immigrants strengthen the country because of their hard work and talents. Among older adults, views are more negative: On balance, somewhat more of those 50-64 (54% to 39%) and those 65 and older (50% to 39%) say they view immigrants as a burden rather than a strength. Views among older adults have become more negative since the question was last asked in early 2014. Among whites, more say immigrants are a burden (49%) than a strength (43%). More blacks say immigrants strengthen the country (55%) than burden it (33%). Views of immigrants are especially positive among Hispanics: Nearly eight-in-ten (79%) think immigrants strengthen the country through their hard work and talents. Hispanics born outside of the U.S. view immigrants’ contributions positively by an overwhelming 92%-6% margin. Hispanics who were born in the U.S. also view immigrants’ impact on the country positively, but by a narrower margin: 67% say immigrants strengthen the country, while 27% say they are a burden. Across education levels, college graduates are more likely than those with less education to say immigrants have benefited the country. Overall, 63% of college graduates evaluate the impact of immigrants on the country positively, compared with 50% of those with some college experience and 44% of those with no more than a high school diploma. Democrats rate their party better than Republicans when it comes to representing their views on the issue of illegal immigration. About half (51%) of Democrats and Democratic leaners say their party is doing a good job representing their views. Just 34% of Republicans and Republican leaners say this about the GOP. Overall, 83% of Democrats and Democratic leaners support a path to legal status for undocumented immigrants. Among this group, 55% say the party is doing a good job representing their views on this issue; 38% say it is not. Democrats who oppose a path to legal status (16% of all Democrats and Democratic leaners) are more critical of their party: Just 30% say the party does a good job of reflecting their views, while 70% say it does not. On the Republican side, both supporters and opponents of legal status for undocumented immigrants think the GOP is not doing a good job representing their views. Republicans and Republican leaners who oppose legal status are somewhat more negative about the party on this issue (65% bad job vs. 30% good job) than those who support a pathway to legal status (55% bad vs. 36% good).